Good morning class. The time change has my live link time a little confused. I think this should work correctly now. We never change times in Arizona and sometimes that doesn't work in our favor. Round SIX of Alphabe-Thursday will start immediately. We will not have a break in between rounds like we've done in the past even though next week is Thanksgiving! It's hard to believe we've done the alphabet five times before, but I'm still enjoying it so I'm still going to keep it going. I haven't even figured out if I'm doing a theme this round or just random stuff. I like doing it both ways...so maybe I'll surprise myself! I also want to let you know that each week I visit every blog. If it appears I haven't visited your blog by the following Thursday evening, please let me know! I am one week behind in my reading, though. Just starting on the letter Y's. I don't have Z this week, but I will visit the others. yay! it's the last one for me, I won't be joining the next but perhaps the next one. it's been a good trip through the alphabets, so thanks for hosting. I am ready for the next round, we don't celebrate Thanksgiving as our ancestors stayed here and didn't escape with the Mayflower ! Zoom-Zoom as we go through the Alphabet to and fro. This round has ended, but another one will be beginnin'! Thanks Miss Jenny for being the Teach we need in helping us with our A, B, Cs! Ooo, another round -- nonstop! I'm ready with a theme this time! I'll have to sneak away from the turkey cooking but that's OK! Oh, Thank you Ms Jenny! another round! yay, I'm ready! I've thought of doing a theme before and then have changed my mind. What I like best about Alphabe-Thursday is that it leaves the field wide open creatively. You can pretty much write about anything! Mrs. Matlock, I would like to be excused from the next round as I have a few projects I have to get caught up on. But, don't rule me out for future fun! I love the alphabet posts! Please keep up the great job of hosting...still my favorite meme ever! 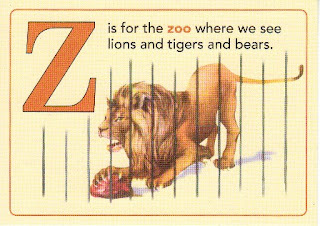 As a child I loved the zoo. Always a great time here! I am excited for the next round! Have a great weekend! Thank you hosting and a very good teacher.